Everyone in Australia has heard the story. The Australian media have a borderline obsession with it. The story is the presence and spread of the cane toad across the Australian continent. In 1935, the cane toad was introduced from Puerto Rico as a method of controlling the Greyback beetle that was destroying the sugar cane crop in Queensland. This they achieved. However, since then their successful procreation and migration shifted their status from savior to number one ecological threat. No other animal has occupied the Australian consciousness like the cane toad. It has achieved anti-hero cult status. 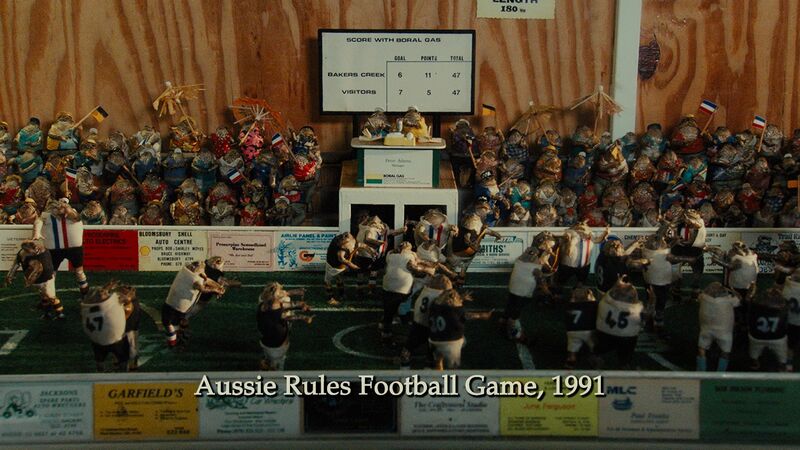 The current exhibition by taxidermist, Kevin Ladynski, at the Ralph Hughes Gallery in Sydney , creates sculptures of clothed stuffed cane toads into elaborate dioramas such as a football match, or a nightclub, or a prison. 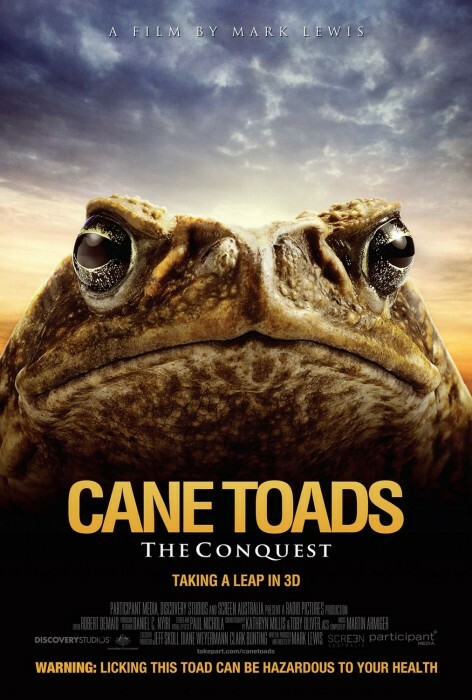 This exhibition coincides with the release of the Mark Lewis film, Cane Toad: The Conquest, an unconventional tongue in cheek documentary about the cane toad problem and the partner documentary to Lewis’ cult 1988 film Cane Toads: An Unnatural History. 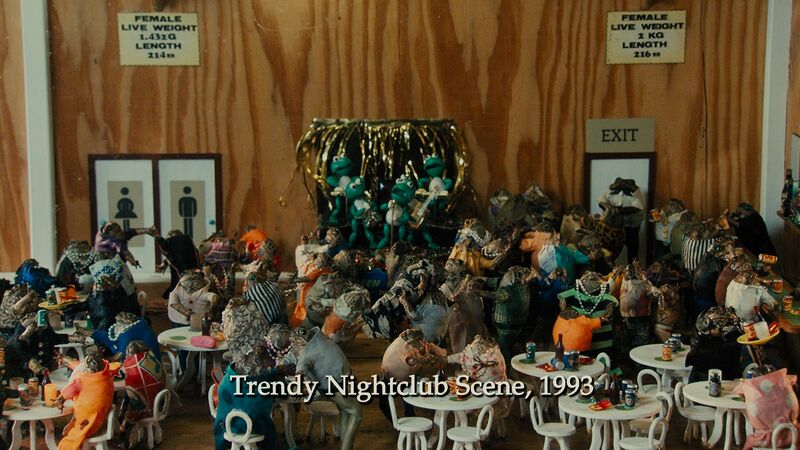 Ladynski features in this second film as a character with an earnest interest in the cane toad that inspired him to create a travelling roadshow of his toad dioramas. He is a real life version of Steve Carell’s character from Dinner for Schmucks who similarly performs taxidermy on mice to arrange them into scale models. Ladynski sculptures are captivating for their level of detail – creating a peculiarly humorous response that, perhaps unintentionally, challenges the hardline ‘cultural construction’ of the cane toad. Images: Kevin Ladynski, Ray Hughes Gallery. The dominant view aggregated by the Australian media is riddled with paranoia about the cane toad. The extent of the paranoia has resulted in a very public promotion of animal cruelty such as the ‘not in my backyard’ campaign in which public representatives call people to take part in the ‘cane toad busting season’. Yet the true cause of this ecological imbalance that features the cane toad was infact a human blunder: the original decision to introduce the toad. The success of the cane toad in the Australian ecosystem is that they have no predators and therefore have spread throughout Queensland and much of the north of the Northern Territory and are said to be into Western Australia and New South Wales. There has been no evidence that the effort of humans to stop their advance has had any success. The result is that people have developed fanatical opinions on them, mostly swaying towards extreme prejudice. Yet the cane toad migration has significant parallels with the development of the Australian nation from the success of the migration from the First Fleet. The cane toad is simply doing what cane toads do best which is procreate and eat. It is unfortunate for many other species of animal and plants that it is so successful at this. It is their social construction in nationalist ideology that is the worrying aspect of this story. The idea of ecological natives and non-native animals is grounded in a nationalist ideology that defines what a place is and who is allowed to be in it. The cane toad has been flagged as a non-native therefore it is demonized. The extent of this is that the violence promoted against the cane toad even includes politicians encouraging children to kill them by any means possible, including beating them with baseball bats. This outright promotion of animal cruelty seems deeply disturbing. What ethical foundation are we constructing for our children by condoning beating an animal to death with a bat? There is a worryingly silent hegemonic nationalist ideology that feeds through society, and like the cane toad treatment, is echoed again in the policy for asylum seekers. There are those that are deemed native and those that are not and ethics become compromised with those that are not. Like the promotion of ‘toad busting’, the present treatment of asylum seekers or non-natives to Australia has questionable ethics including imprisoning children in detention camps and the suggestion that asylum seekers be shipped to countries with a bad track record of human rights standards. This construction of what is native or natural and what is not natural is drenched in questionable nationalist dogma and it should always be challenged. Kevin Ladynski’s exhibition and the Mark Lewis film offers up a new way of looking at the cane toad which hopefully encourages people to empathize with their position as the ‘non-native’. Nicola Moir is a regular contributor to NLP who is a successful artist in her own right (see Claudia Massie’s recent interview with her for NLP). She lives in Sydney with her family.